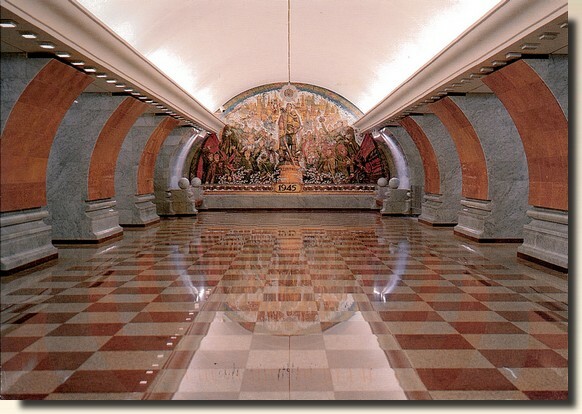 Park Pobedy is a Moscow Metro station in the Dorogomilovo District, Western Administrative Okrug, Moscow. It is on the Arbatsko-Pokrovskaya Line, between Slavyansky Bulvar and Kiyevskaya stations. At 84 metres underground, Park Pobedy is the deepest station in Moscow and the second deepest in the world by mean depth, after Kiev Metro's Arsenalna, and the very deepest station by maximum depth, 97 m. It also contains the longest escalators in Europe, each one is 126 metres long and has 740 steps. The escalator ride to the surface takes approximately three minutes.